To keep anime-supreme running we require donations to help pay for the server that hosts this website, the xdcc bots in the IRC channel and our FTP. 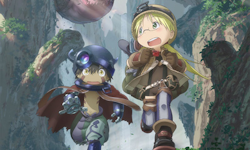 If you like our anime and can help out by donating please join our irc channel and talk to a staff memeber or email us at donations(at)anime-supreme.com on how you can donate. Thanks! On the planet Aqua lies the watery city of Neo Venezia, a tourist hub in which people travel around in gondolas. Professional gondoliers known as Undines are well-revered as they act as tour guides for the people. 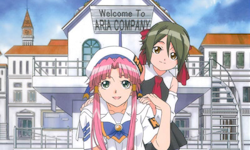 Akari Mizunashi is a gondolier in training and also an employee of Aria Company. She gets to meet all sorts of people as she takes them on the gondola rides, from friendly mentors to special individuals, all this admidst the beautiful scenic backdrop of the entire city. The enormous cave system, known as the Abyss, is the last unexplored place in the world. Nobody knows how deep down goes this titanic pit, inhabited by strange and wondrous creatures and full of mysterious ancient relics which purpose in unknown to modern man. Generations of bold adventurers have been drawn by the cryptic depths of the Abyss. In course of time those brave enough to explore the dangerous pit came to be known as Cave Raiders. Long ago, Youma, shape changing demons, took human form to live in disguise in human towns, feeding on them in secret. A secret, nameless society has discovered a way of implanting Youma flesh into humans to create hybrids powerful enough to defeat the Youma. A hybrid's standard abilities include faster healing, limited shape modification, the ability to detect Youma and other hybrids, and overall enhanced physical prowess allowing them to wield massive claymores, for which they are named: Claymores. For reasons not divulged, only women are selected to be Claymores. They are often chosen for implantation after being the sole survivors of a family attacked by a Youma; this ensures their loyalty and willingness to endure the painful hybridization process. The society sends Claymores to towns that can afford their fees to kill Youma. The society is often strict and harsh; Claymores who break the rules risk being hunted down by their fellow warriors. 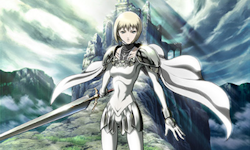 The story of Claymore follows the adventures of the beautiful warrior Claire, who fights demons while struggling to hold on to her own humanity. The world literally unravels for a group of Tokyo teens as they attempt to discover the truth surrounding the death of one of their friends. 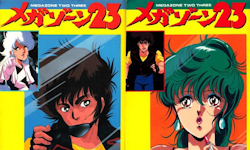 Everything turns inside out once Yahagi Shougo gets his hands on a top secret power bike and is hunted by the authorities. When Shougo turns to his friends for help, they discover a complex web of dark, political intrigue and shocking government cover-ups.